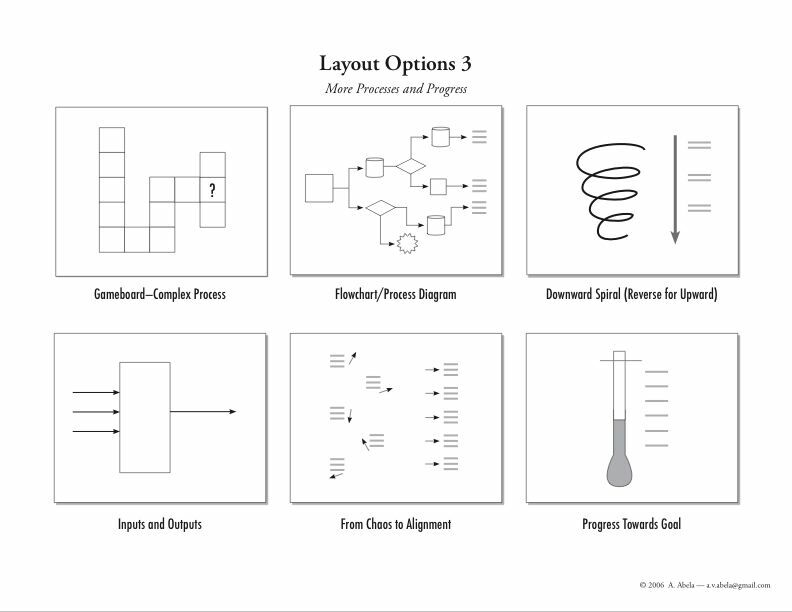 In an earlier post, I explained how to design pages that pass the squint test, to achieve the simplicity aspect of what Edward Tufte calls "simplicity of design and complexity of data." At that point I promised to share 36 examples of such pages. Here they are; you can download them in two versions. 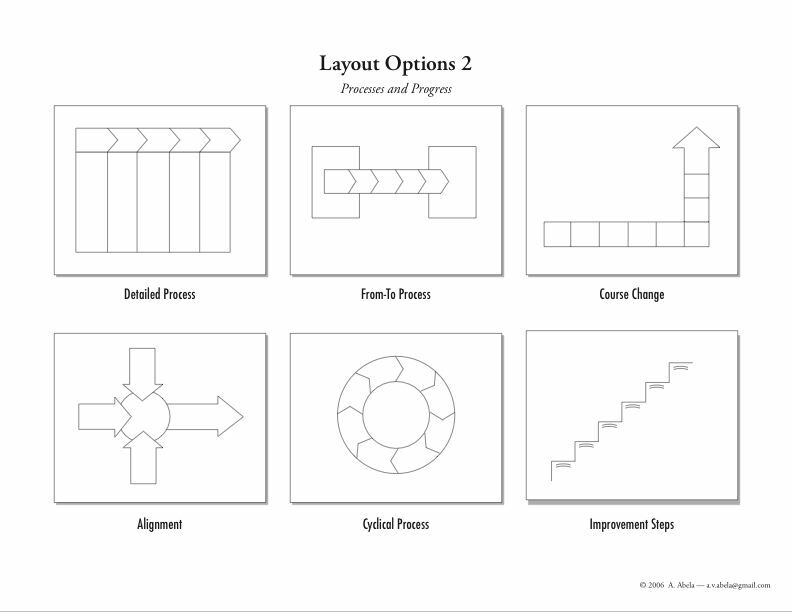 The first version is a .pdf file with thumbnail images of all 36 options, six per page for a total of six pages, which you can quickly flip through each time you are trying to decide on a page design (these are the ones that are illustrated here on the blog). 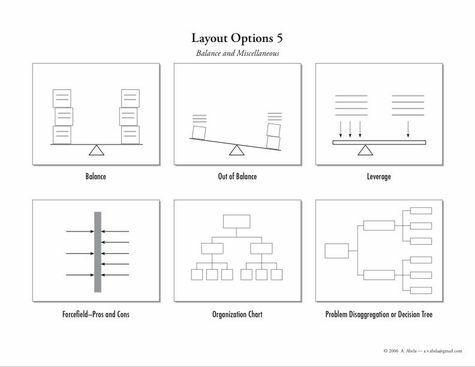 The second version is a PowerPoint file with all the 36 slides; copy the relevant ones to help you create your own presentations. 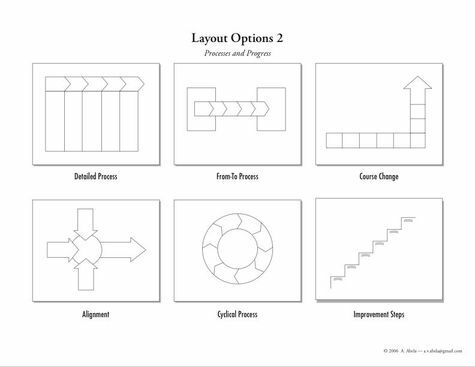 Download 36_page_layout_ideas.pdf and Download SlideTemplates.ppt Please send me examples of any new variations that you create, and I will post them on this blog for others to use. Very insightful. 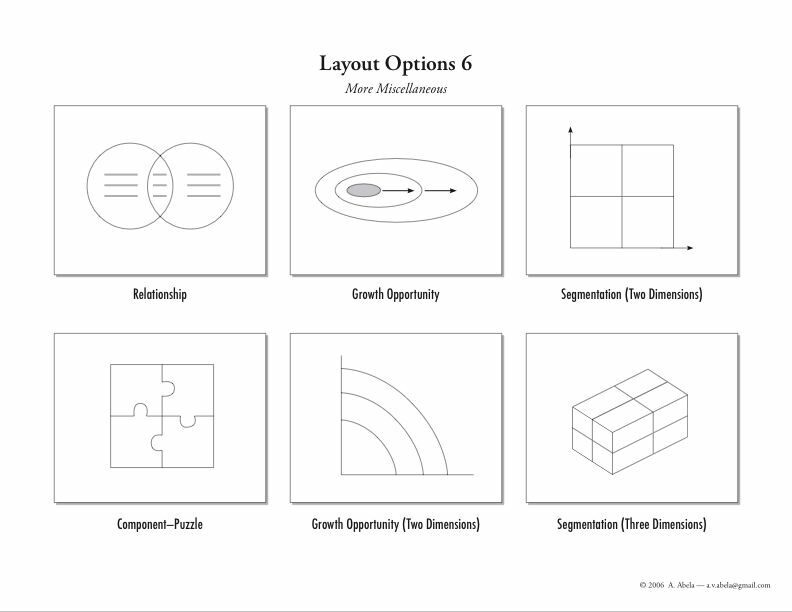 Would help me a lot in my MBA. Fascinating and creative. 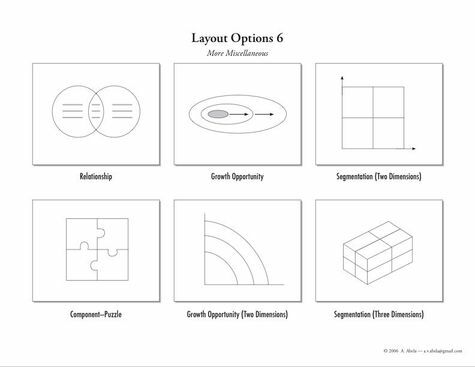 I am trying to create a presentation for investors for a startup – this method would be great to incorporate in my slides. Just stumbled across your site and think it’s terrific. 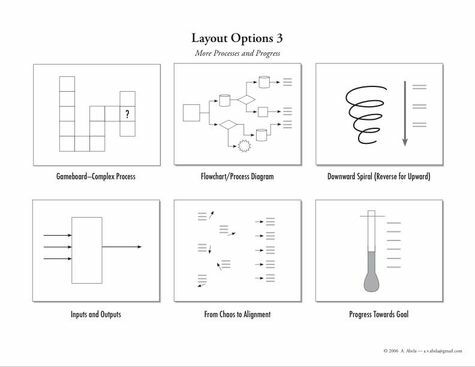 Even though I’ve been alert to the challenges of visualization of data for years, I’ve never seen such an organized and systematic approach to those challenges. And you follow your own advice too. My staff is going to see this. Thanks John! Glad you’re finding it useful. I’m a newcomer to your site, and I’m very interested in the approach you propose. I wondered if you have some sample presentations you could share with your readers? I’m particularly interested to find out more about how you would suggest the presenter uses text in these designs. Welcome Stephen. I do have a number of examples that I hope to post in the near future; the challenge is that they come from my clients and usually contain confidential data, so we have to edit them carefully and then get the client company’s approval before making them public. 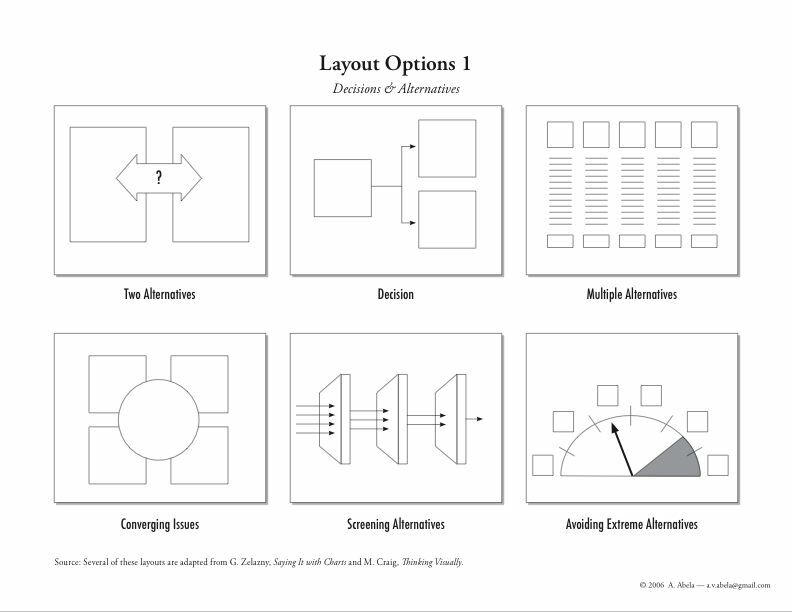 That said, there are several examples in my new book, Advanced Presentations by Design. 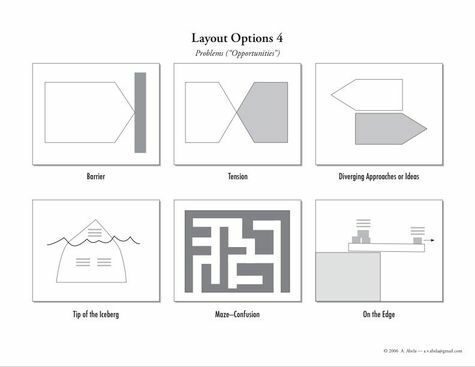 These templates are great! Any recommendations for where to find more? 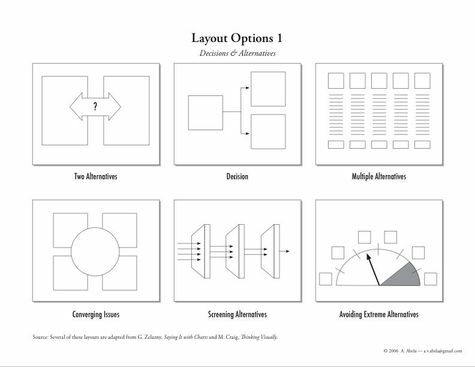 Has anyone made these templates into a Keynote file? We don’t use Powerpoint.